Nathan Hill raves over Dennerle's new marine nano tank. A name that’s usually associated with planted and shrimp aquaria is now demonstrating that it intends to be taken seriously in the marine market. Dennerle has come up with what is frankly one of the best nano kits I’ve come across so far. Someone new to the hobby may find the filter a little unforgiving, so have a play with it before setting up the unit. The surface skimmer, which should not be confused for a protein skimmer, requires a little adjusting to run optimally and fitting the mechanical foam filter requires ingenuity and patience. Apart from that, it’s pretty basic and easy to use. The lighting is well thought through, as well as being particularly aesthetically pleasing. A 10,000K, four-pronged compact fluorescent is included, with a three white to one blue ratio. This means that we see a strong hint of blue and makes sessile inverts a very real possibility. The light is built for durability rather than ease, as you’ll discover when trying to change the lamp, but at least it’ll not break when becoming wet. In this model you get 24w of compact for your money, with a reflector as standard. 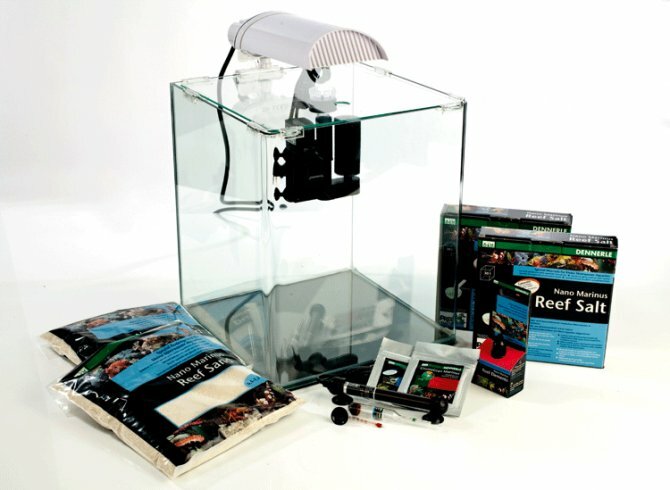 As is becoming the trend, a 50w pre-set heater features and keeps the aquarium at 25°C/77°F at all times. To monitor this, a nano-thermometer is also included. The model actually looks like a heater for a change — as opposed to some of the solid resin blocks I’ve witnessed. Salt is part of the parcel, with 2kg of a nano-focused nitrate, silicate and phosphate-free mix with measuring spoon ready to be prepared and added. There’s also a dinky hydrometer in the pack to put your mind at ease. If that’s not enough, there’s even a pouch of coral food, crustacean food and a bottle of reef elements. You don’t even need to buy your own substrate, as 4kg of reef sand sits bagged up like a pleasant surprise at the bottom of the kit. Of course, there’s also the tank itself — at 30 l/6.6 gal in capacity, with smart curved front edges, it boasts the usual insulating base mat, cover glass and a jet black backing sheet too. This set-up really does come with everything included — except water and livestock! This is simply an excellent kit and, hovering at around the £200 price mark, it will find a wide and keen audience. I love it and cannot wait to give it a thorough, longer-term trial. The only thing missing is a protein skimmer, but I suspect that, handled correctly and water changed frequently, this won’t make a scrap of difference. Prices: RRP is £249.99. UK wholesaler and distributor J and K supply these to the trade.